This article describes the common issues and fixes related to Crow Canyon Advanced Approvals App. 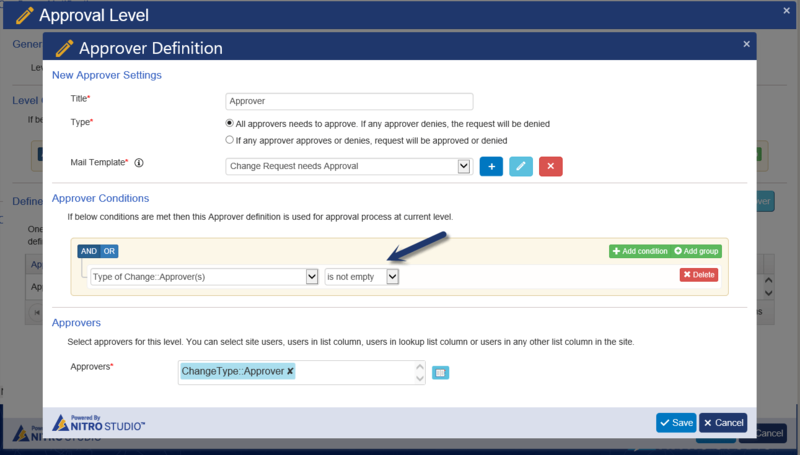 If we configure approval setting to read approver from lookup item and if the approver value is blank in the selected lookup item then “Approval Status” sets to “Approved” and sends the approved notification to the users configured in “Users to Notify” section in approval configuration. For example, we have “Type of Change” and “Change Requests” lists. We have “Type of Change” lookup column in “Change Requests” list. Approver Definition configuration is as shown in below screenshot. In the above case, we would like to set the “Approval Status” to “Not Required” instead of auto approving and sending mails. If there are no conditions set in the Approver definition configuration, for every item approval status sets to “Approved” if no approver is found in utility/lookup item. We can add conditions to skip the approver definition. For example, add conditions like “lookup::Approvercolumn” is not empty so approval process gets executed only those for which approvers are available in the selected lookup item. Otherwise, approval status remains at “Not Required” in the item.